We will price match new textbooks (purchased) from Amazon, Barnes & Noble, and other qualified sellers. Price match not available on third-party sellers on Amazon, Barnes & Noble, etc, online marketplaces, auction sites, direct from publisher, aggregator sites. Matched books must be in stock both in our store and with the competitor. Does not apply to any rental, used, digital books, access codes, international editions, and instructor copies. Must present lower price within three days of purchase (in store) or pickup (online order). Lower price must be shown in-store via live web page on mobile device or computer. Must have original purchase receipt. Reprinted receipts are not eligible for price match. 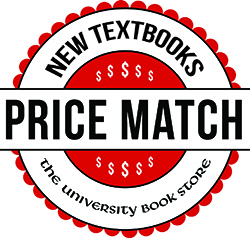 Price match received in the form of a University Book Store gift card at the Textbook Service Counter. Maximum $100 per item and $1000 per customer. Must be the exact same textbook and ISBN number.